It’s already a great trip to Europe. We started off the day right with a breakfast of chocolate chip cookies with nuts and some more of the fresh strawberries, in our hotel room while the fresh air wafted in from the open doors on the balcony. Right there you’ve got the makings of a good day. 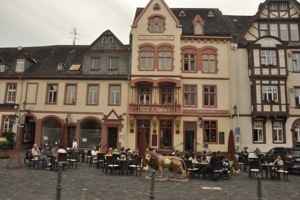 We walked back into the shopping district of Weilburg to get a top-up card for the cell phone, and with a little finagling and punching lots of numbers on the phone, I now have the miracle of Internet on my phone. EU9.90 bought me 500 megabytes of data, which should be more than I need for the days we are in Germany. We detoured a bit, stopping in at the Hopfbahnstrasse (train station) for a coffee for Eleanor and then returned to the hotel to pack up our gear. The car rental people have assigned us a Citroen C3, which turns out to be a rather boxy compact car with not much of the get-up-and-go you’d want for Autobahn driving. Where we were driving the Autobahn was far from being a vast open highway where you can mash the pedal and zoom to your heart’s content. It’s a fairly crowded two or three- lane road filled with trucks and plenty of sudden traffic to cause rapid deceleration with little warning. We managed to reach 140 kph at one point but the rest of the time we were driving at typical American Interstate speeds and often far slower. This has tainted one of my long-time driving fantasies, but to be fair I never fantasized about driving the Autobahn in a Citroen. 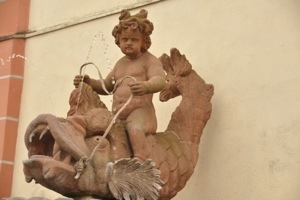 50 miles later we were in the charming town of Weilburg. 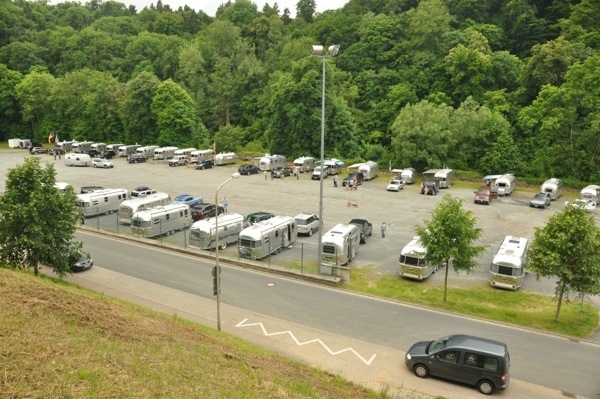 The encampment is just below the old city, which perches atop a hill surrounded by the Lahn river. At the very top is exactly what you’d expect, a castle. Down below is exactly what most people would not expect: 54 Airstreams. 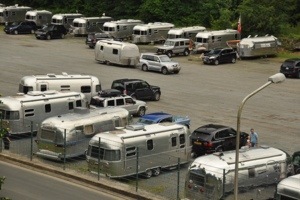 I love the odd (by American standards) collection of tow vehicles that arrived with the Airstreams today. There’s everything from a 1950s Buick to a late-model Mercedes G-wagen. Two Ford F-250s are here, which thrills some of the Europeans because they are so American and weird. My favorite is the BMW X6, which I’ve never seen before and looks drastically cool in black. Other tow vehicles include a VW Westfalia camper van, a Buick Roadmaster station wagon, various Mercedes, and many Land Rovers. Armin Heun, our host, handed us a chocolate and then introduced us to a new (European) Airstream model 684, which is somewhat similar to an American 23-footer but with many clever enhancements. We knew it would be different from the US models but were frankly staggered by the improvements the Brits (who build all the EU spec trailers) had worked into it. There are almost too many things of note to list, but among our favorite features are the hydronic heat, electric entry step, the functional kitchen counter, the foot-level blue LED lights, the great roof vent/skylights with double shades (which are also found in the Airstream Westfalias), the clear bi-fold door in the shower, and the awesome electronic control panels that run virtually every system. This trailer also comes with electric power movers to help push it around the tight European campsites, satellite TV, hidden stabilizer jacks, a parking brake … the list goes on. Some of this stuff needs to come to America. Part of the cultural experience of being in a foreign country, for us, is to shop with the locals. We pointed the GPS at a local REVE (grocery story chain) and picked up a few necessities for the Airstream, plus some light food for us. After returning from this errand with plenty of breakfast food, Armin dropped by to leave a full grocery bag of breakfast foods for us. So we have at least double what we need. I may have breakfast twice tomorrow. 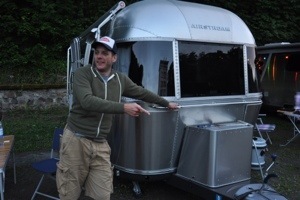 I got a quick tour of the Airstream systems, partly from Armin and partly from Michael Hold of Airstream Europe. These trailers have very little onboard holding tank capacity, so gray water goes into an external tank much like the “blue boys” we use in America. Fresh water comes from an external tank called an Aqua-Roll. You roll it over the fresh water spigot, fill it, and then roll it back to the Airstream. The toilet is a cassette style, so later I’ll get the experience of dealing with that, but it should be no big deal. 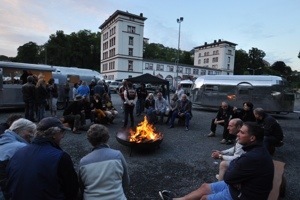 We also met up with Pete and Tracey Bull, UK full-timers who have organized many Airstream rallies there. Pete is the UK distributor of Airstream Life, but until today we have never met or even spoken on the phone, so it was a distinct pleasure to chat with them in our 684 for a while. The agenda for this rally is typically light. Tonight’s only official activity was a huge campfire and music until 11 a.m. I have a feeling it would have gone much later if the local ordinances allowed it. Airstream Germany brought over a “bar” Airstream and offered open bar to all (courtesy of Airstream Europe). We headed back to our Airstream after 10 p.m. to call Emma and finish setting up inside, but even now at 11:30 p.m. I can hear people talking and laughing outside by the fire. Tomorrow looks like it will be another full day. Can’t wait. I would LOVE to see some (probably all!) 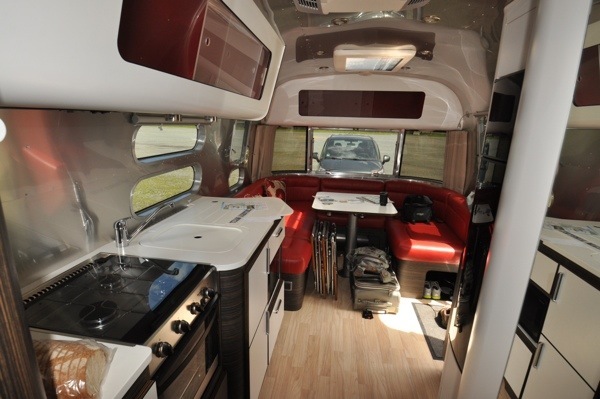 of the features of the Euro-spec Airstreams available in the US! Hopefully Airstream is reading this blog . . . I would love to see photos of the Buicks. I hope you can find time to photograph and post them. Would love to be on your trip.